The primary legislative focus nationwide for the next few weeks will be the elections which will occur on November 8th. We are experiencing a very unusual Presidential election season this time with two very unusual candidates. We have our first ever woman candidate breaking through the glass ceiling of a male dominated position. We also have a non-political businessman candidate breaking into the political empire. This combination of candidates has given us a unique presidential campaign season introducing behavior and issues unheard of in prior elections. At least it is not dull. We must also remember that all of our state General Assembly members will be up for election this November as well as all our national congressmen and one senator (Sen. Richard Blumenthal). Now is the time to meet your candidate for your house or senate district. Invite them in to have a meet the candidate night and invite your community to this event. Ask the candidates about local issues that you are concerned about and ask about their concerns and plans. 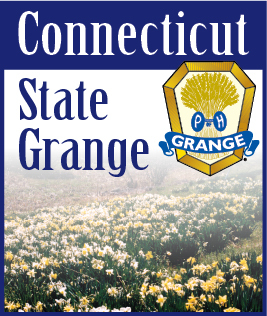 Remember that the Grange is non-partisan so we can not endorse any candidate or show favoritism for one, even if they are a Grange member. If you have any questions on voting, the Connecticut Secretary of the State web page has a lot of information that may help. http://www.sots.ct.gov/sots/site/default.asp . For a listing of who is running in your area check out BallotPedia - https://ballotpedia.org/Connecticut_elections,_2016 . There is a “What’s on Your Ballot” section near the top of the page where you can enter in your address and find information pertaining to your home address. Remember to vote on November 8th, even if you are not comfortable with any of the major candidates, as there are rumors around that many are. The other national and state legislative positions are also extremely important in the running of this country and your state. Your vote will always be important. If you are going to be out of town or unable to get to the polling places on November 8th, apply for an absentee ballot. They may be picked up at your local town hall or downloaded from the Secretary of the States web site - http://www.sots.ct.gov/sots/lib/sots/electionservices/electforms/electforms/aabeng.pdf . Remember that they must be received in the mail or returned in person to your municipal clerk by the close of polls on the day of the election or they will not be counted.